The following overview of the OPS Youth Booth Program at ORAPEX has been thoughtfully provided on behalf of the volunteers who continue to make this program a success. 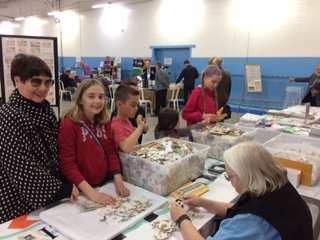 The program has been institutionalised within the Ottawa Philatelic Society who proudly sponsor this initiative. For further information or to make a donation, please contact us. 3. Provide practical information to parents/guardians to assist their child in the hobby. Our slate of bilingual volunteers provide a "goody bag" for each youth (under 18) who presents themselves at the booth. The goody bag includes a packet stamps, a philatelic newspaper and/or magazine, a few covers, and a few tips on collecting stamps. If they need, we provide a stockbook, packets of hinges, a pair tongs, and a magnifyer. 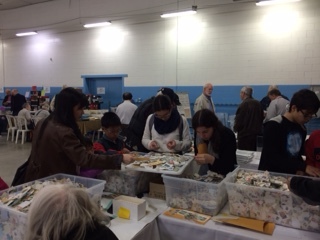 The volunteers offer collecting tips, ideas and assistance to the young collectors. 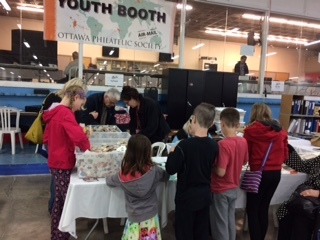 The Youth Booth offers them the opportunity to root through donated kiloware to find stamps they need. This is a big draw as it is hands-on fun! There are also catalogues and covers from which thay may choose. 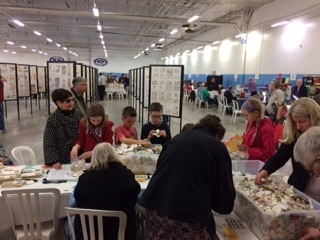 Adults who accompany children to the show may assist their children in rooting through the kiloware to find stamps they need. 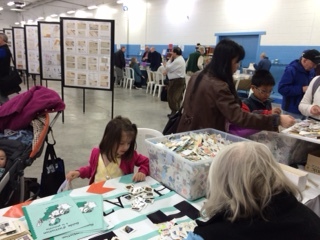 Everything at the Youth Booth is donated by members of the OPS, RA Stamp Club, APO, the stamp dealers at ORAPEX, and the general public. We also receive monetary donations through our club auctions and from various stamp organizations such as BNAPS. We do not sell stamps or covers to adults. We do however sell donated books and catalogues to adults. The money earned from sales at the Youth Booth is used to purchase stockbooks, tongs, hinges and magnifiers for the children.